Giants award day went well with all pomp n show.Dr.Manohar Parikkar As chief guest and the presence of our world chairman with his wit and humour was pleasant experience. 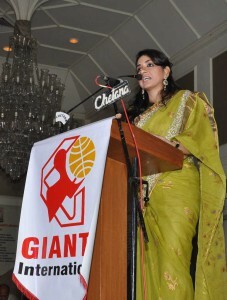 Giants International has grown up over the years to more than 25000 members through 600 groups spread the world over. I am humbled and it is a great honour for me to be nominated and elevated to the highest echelons of the Giants hierarchy. I am thankful to him and you all who have built up Giants as an NGO of notable presence in India and in many other parts of the world. The challenge before me is to live up to your expectations of being an illustrious daughter of an illustrious father. I am confident that I will adhere to the lofty principles that Giants stand for , make it dynamic and vibrant to achieve sustainable growth in quality and quantity. Let happiness prevail the world over ! Together we will work for the betterment of the less fortunate brethren, empowerment of women, molding youth to be responsible citizens, planting of more trees against global warming, propagating ‘Yoga’ for world health, extending a helping hand in calamities – all will be our priorities. These all and more is possible when we work as a team asnd I am sure you will extend all cooperation. Innovation and Service above Self will be our motto. A fashion designer, she is often referred to as Queen of Drapes. She holds a record in Guinness Book of World Records for draping fastest saree. Her 55 innovative ways of draping saree has brought glory to her fashion designing career.